Moreton-in-Marsh is one of the largest market towns in the North Cotswolds and is situated at the crossroads of the Fosse Way a Roman road, now the A429, and the A44. The town has a wide main street with some wonderful 18th century inns and houses in characteristic Cotswold Stone including the prominent Redesdale Hall which was built in 1887. The hall given to the parish council in September 1974 is run and maintained by a charitable trust, the Redesdale Hall Management Committee. Today the hall is used for antique fairs and flea markets etc but can also be hired out. The 16th century Curfew Tower, with the old town lock-up at its base, is one of the oldest buildings in Moreton found on the corner of Oxford Street and the High Street. It is said that the towers bell, cast in 1633, was rung nightly until 1860 to remind people of the risk of fire at night and its clock was built in 1648. Close to the tower is another old building the White Hart Hotel thought to have been the centre of the Royalist Cavalry during the English Civil War and that King Charles I stayed there on the final march from his Oxford Headquarters. The Moreton-in-Marsh and Batsford War Memorial is also situated in the High Street. The town houses two churches one in the Old Town and the other in Oxford Street. Moreton-in-Marsh was given its market charter in 1227 and still holds a weekly market every Tuesday. When the Stratford and Moreton Tramway was built between 1821 and 1826 linking Moreton with the Stratford-on-Avon Canal the town became a traveller’s town and was used as a coaching station. It was horse drawn until 1859 until the arrival of the Oxford to Worcester Railway in the mid 1800’s. Aston Magna is a pretty hamlet located just off Fosse Way the Roman road which is now the A429 and the Oxford, Worcester and Wolverhampton Railway runs through the middle of the village. Draycott is a small village with a lovely village green where the locals hold a summer barbecue every year. Blockley is a very attractive village with little alleyways and steps disappearing between closely knit houses of which many of them are built on a series of terraces that step down the east facing hillside to the stream, Blockley Brook, at the bottom. Blockley Brook is a tributary of Knee Brook which is a tributary of the River Stour. Most of the houses are 17th and 18th century built in characteristic Cotswold stone. The village houses two pubs the Crown Inn and Hotel, a former coaching inn and the Great Western Arms belonging to the Hook Norton Brewery. The village since 1984 has been the base for Watsonian Squire the largest UK manufacturer of sidecars and trailers for motorcycles. Blockley’s church of St. Peter and St. Paul is late Norman, built in about 1180. The Post Office closed in 2007 and in May 2008 under a co-operative agreement the residents of Blockley opened a new local not for profit store. The store is a grocer, newsagent, post office, off-licence and cafe with free broadband. Blockley’s industrial past, as with a lot of Cotswolds villages, was wool and when the wool trade declined in the late medieval period Blockley then prospered in silk for many years supplying material for mills in the Midlands. There were once eight mills in the area which today are now private dwellings. The Diamond Way is a 66 mile long distance footpath created by the Ramblers Association in 1995 to celebrate the Queen’s 60th Jubilee. The scenic diamond shaped walk through rural Gloucestershire takes in many small villages stretching from Northleach in the south to near Chipping Campden in the north, Guiting Power in the west to near Bourton-on-the-Water in the east. 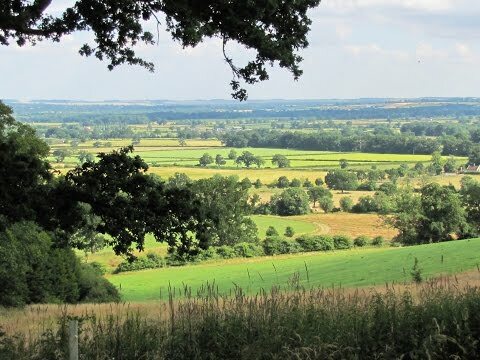 The Heart of England Way is a long distance footpath running for 100 miles through the midlands from Milford Common on Cannock Chase passing through Staffordshire, Warwickshire and Gloucestershire before ending at Bourton-on-the-water in the Cotswolds. The path links to the Beacon Way, Staffordshire Way, Arden Way, Cotswolds Way, Oxfordshire Way and the Thames Path. Monarch’s Way is also a long distance walk more or less following the escape route taken by King Charles II in 1651 after being defeated in the Battle of Worcester. The route is 615 miles long and marked with yellow discs with a ship “The Surprise”, the Prince of Wales crown and the Royal Oak tree at Boscobel House. Starting at Powick Bridge at Worcester the path runs north to Boscobel then south to Stratford-upon-Avon continues south to Stow-on-the-Wold before turning south west to Cirencester and Bristol. It then heads south across the Mendip Hills to Wells then on through Somerset and then south west to Charmouth where there is a short section along the Dorset coast before turning north to Yeovil then turns east across the Downs to Brighton and Shoreham-by-Sea. From the car park we walk through the arcade signed Access to High Street. We turn right onto High Street and walk up the road on the left hand side. At nearly the end of Moreton we turn left on the public footpath into the park. We follow the little stream on our left then turn right through an avenue of trees to meet the road. Going through the gate we cross the road and go through the gate opposite into a field. We walk through the field diagonally left to the corner then go through the gate next to a dead tree. We head forwards following the hedge then go through a gateway and keep heading forwards until we come to a building in front of us. We turn left then right by the side of the building and follow the track. When we reach the end of some trees on our right we bear slightly right uphill then left downhill following the hedge to cross a stream. We now turn right and head towards a house. Just in front of the house we turn right to go under the railway bridge then left and follow the path to Aston Magna. On reaching the village we turn right then opposite the old church we turn left and follow the road over the railway line and through the village. We keep following the road and when we come to the end of a wood on our right and a sharp right in the road we head forwards at the public footpath sign. We cross over two fields and then picking up the road again we turn left to Draycott. At the cross roads we turn right and follow the no-through road round to the left. We then head forwards on the path between the wall and the telegraph pole. We come out of some trees and head straight forwards over a field. In the second field we bear left and come out at a road. We turn left then after a short way we turn right at the public footpath sign through the hedge. We head forwards across the fields to a gap in the hedge and cross a tiny stream. We head forwards over the stile in the paddocks and walk down to the end of the hedge and turn right over a stile then head forwards passing the mill and mill houses to meet the road. We cross straight over and follow the track past a house and at the bend we head forwards into a field and walk round the edge. We go through a few trees into another field and head forwards to a wall corner then bear slightly left uphill to the right of a row of houses. We go over the stile in the corner cross the road and over the stile opposite into the field. We head forwards until we come to a broken dead tree in the middle of the field. We then turn left and head uphill towards a gate and a lone tree and go over the stile to the right of the tree. We walk straight forward over the field to the road then cross straight over to take the lane opposite sign posted Back Ends. After a short way we turn left at the green with houses in front of us onto a lane towards the church. We walk straight forwards over the road downhill to go through the churchyard then turn right along the road past Lower Brook House Hotel and restaurant on the left. Just after the last building we turn left at the public footpath sign Heart of England Way we head forwards uphill passing a farm on the left. At the top we go over a stile and turn left. We go through a gate and turn immediate right and follow the path with the hedge on our right. At the road we cross straight over and follow the path on the Monarch’s Way through the trees with the wall on our left. We come out of the trees and heading downhill we come on to a track and follow the track which bears left. We make our way to the bottom and with a house on our left we head straight forwards on a path marked with an arrow. We keep heading downhill through the field and pass to the right of the building ahead of us. We keep heading forwards to the left hand corner go through the gate and head forwards, still on the Monarch’s Way through the fields until we arrive back at Moreton-in-Water. We then make our way back to the car park. This is an easy to moderate walk through fields on footpaths and tracks mainly on the Diamond Way and Monarch’s Way. There is also some minor road and some inclines and declines. Elevation: Approx Lowest Point 106m (348ft) Approx Highest Point 254.6m (835ft). Approx 9 miles allow 3½ hours using OS Explorer Map OL45, The Cotswolds. Start Point: Moreton-in-Marsh in the pay and display car park at the back of the Tourist Information Centre. Moreton-in-Marsh in the Cotswolds, Gloucestershire. From the M40 take junction 15 then take the A429 to Moreton-on-Marsh. For the car park take a left turn at the car park sign, just after the Tourist Information Centre. Parking in the High Street is free with a 2 hour limit. The pay and display car park is variable from 50p for half an hour to £3.40 for 10 hours. There are public toilets in the High street just opposite the Tourist Information Centre and for refreshments there is a variety of shops, cafes, pubs and restaurants in Moreton-in-Marsh. There is a general store/post office/off licence, a pub and a hotel in Blockley.